Make sure you're visible to other road users all the way down to your toes when riding at night or on overcast days by wearing a pair of Castelli Reflex Shoe Covers over the top of your shoes. 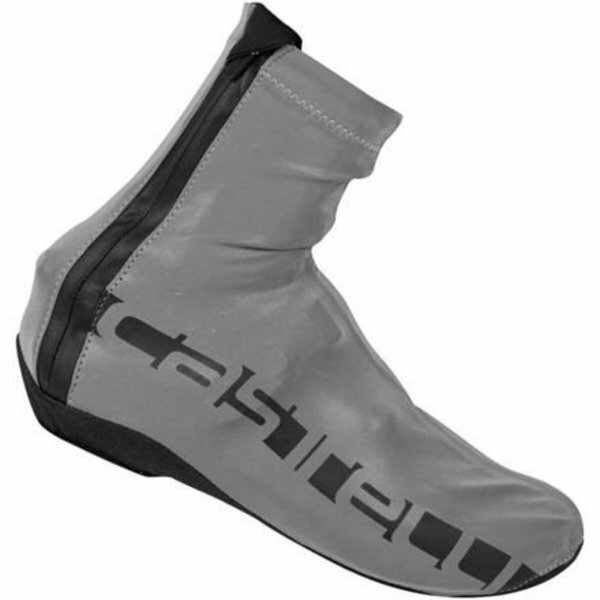 In daylight these Castelli Reflex Shoe Covers appear to be just an ordinary grey pair of overshoes, but they are made entirely of reflective fabric, so they light up like a beacon when caught in a car’s headlights. They're perfect for pre-dawn or after-dark rides and they're pretty much an essential on overcast or rainy days to keep you visible and dry too. Castelli Reflex Shoe Covers are completely waterproof so your shoes stay dry and your toes won't get wet & freeze. All of the seams are sealed including the waterproof zipper. Even though the Neoprene cuff comfortably seals out drafts and moisture at the top, a truly weatherproof ensemble could be achieved by covering it with your tights or leg warmers. Please note that sizing refers to the fit of a sleek road shoe. You may need to size up if your shoe has bulky ratchets and buckles. This cover is not suitable for MTB or Commuter style shoes.